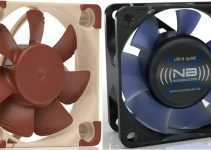 Intel has finally come up with its budget Coffee Lake motherboard chipsets for its 8th generation Coffee Lake Processors. Earlier it has only Z370 chipset which is a high-end chipset and motherboards based on the Intel Z370 chipset are very expensive which an average user or users on budget can’t afford. So, to tackle this Intel has launched its budget 300 series motherboard chipsets that include H370, H310, Q370 and B360. These are more of budget and mainstream Intel 300 series chipsets that you can find in newer motherboards for the Intel 8th generation Coffee Lake CPUs. Q370 chipset is mainly for corporate use only while others are available for both consumer and corporate use. Here Z370 is the top-end coffee lake motherboard chipset and H310 is an entry level chipset that misses out on some features while B360 and H370 forms the budget and mid-range of the Intel 300 series chipsets that are great for mainstream gamers or users. You can check out the comparison of all the Intel 300 series chipsets in the table given below. Update: The latest high-end chipset in the Intel 300 series is Z390 which is a successor to Z370 chipset. It supports Intel 9th & 8th generation processors and you can check out the best Z390 motherboards from the link given below. Here is neck to neck comparison of all the Intel 300 series chipsets including the high-end Z370 chipset for 8th generation Coffee Lake Processors. I am not including Q370 chipset because it is meant for corporate or business use only. All the major motherboard manufacturers i.e. ASUS, MSI, Gigabyte and ASRock have released their new motherboards based on these Intel H370, H310 and B360 chipsets and here I am going to list down some of the cheapest coffee lake motherboards based on these newer Intel 300 series chipsets for users or gamers on tight budget. Here are some of the cheapest Intel 300 series motherboards that you can get for your Intel 8th generation Coffee Lake Processors. These are the motherboards based on the H370, B360 and H310 Intel chipsets. This is one of the cheapest motherboards based on the Intel H370 chipset. 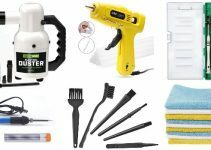 This is a budget H370 motherboard that comes with almost all the necessary features and expansion ports that you want from a gaming motherboard. It comes with two PCI-E x16 slots for graphics cards and dual M.2 slots for fast PCI-E Solid State Drives or M.2 SSDs. It also has a M.2 Socket 1 slot for Intel CNVi wireless module for adding Wi-Fi support. The motherboard has got four memory slots and supports up to 64GB DDR4 memory (up to 2666 MHz). Other features include Intel Optane Memory support, Intel Thunderbolt 3 AIC Support, Onboard 8 channel audio, Intel Gigabit LAN, Dual BIOS, Windows 10 64-bit support, VR Ready and USB 3.1 Gen 2 ports. Display connectivity options include VGA, DVI and HDMI ports. Overall, a nice budget and feature rich H370 motherboard for gaming and professional work. 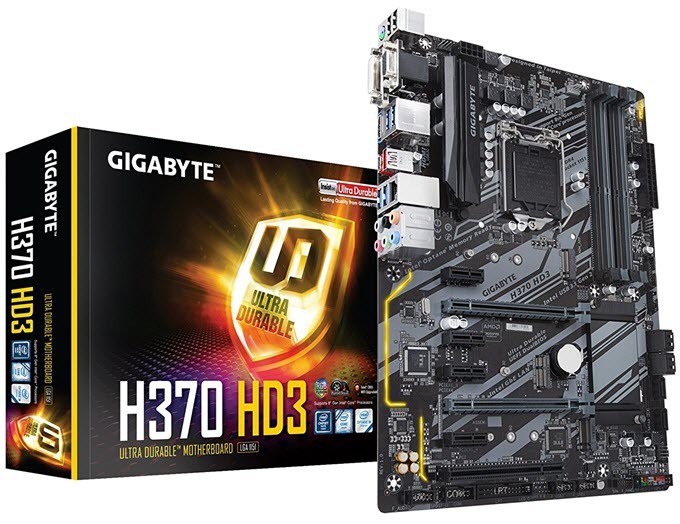 This is the bigger version of the above mentioned Gigabyte H370M D3H motherboard. 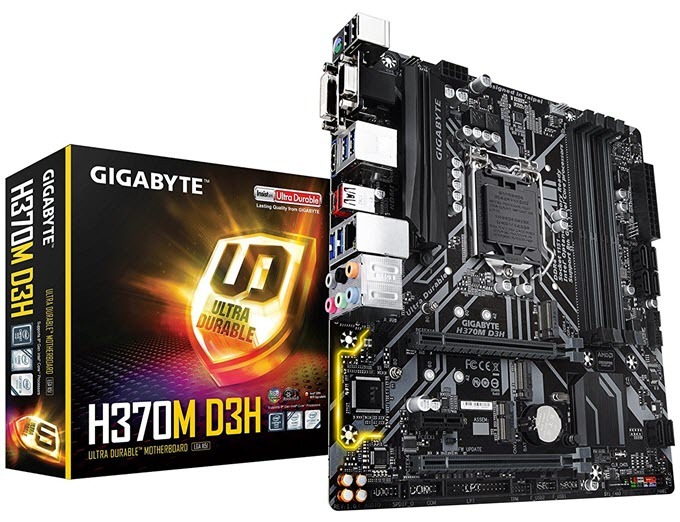 Gigabyte H370 HD3 is a ATX sized motherboard that has got some extra expansion slots compared to the Gigabyte H370M D3H Micro-ATX motherboard. It comes with two PCI-E x16 slots that supports AMD Quad-GPU CrossFire or 2-Way AMD CrossFire multi-GPU setup, four PCIex1 slots and one older PCI slot that comes in very handy if you have any older expansion card to plug in. 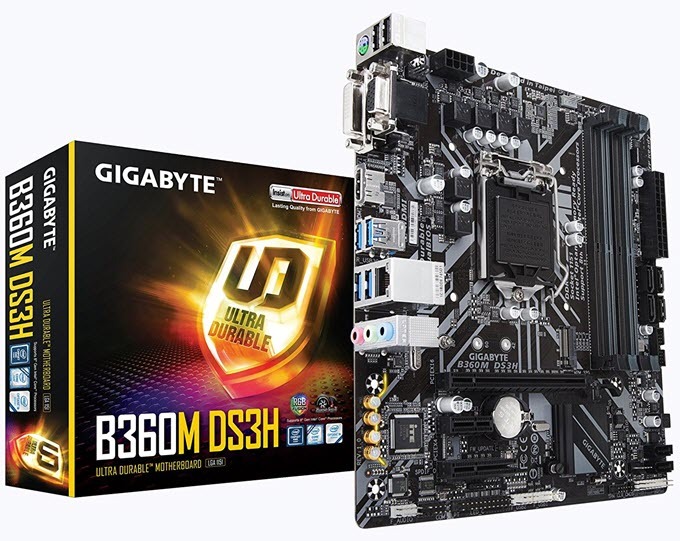 Other features remain the same as in Gigabyte H370M D3H motherboard. So, if you are looking for a budget H370 ATX motherboard then this is the one that you should look for. 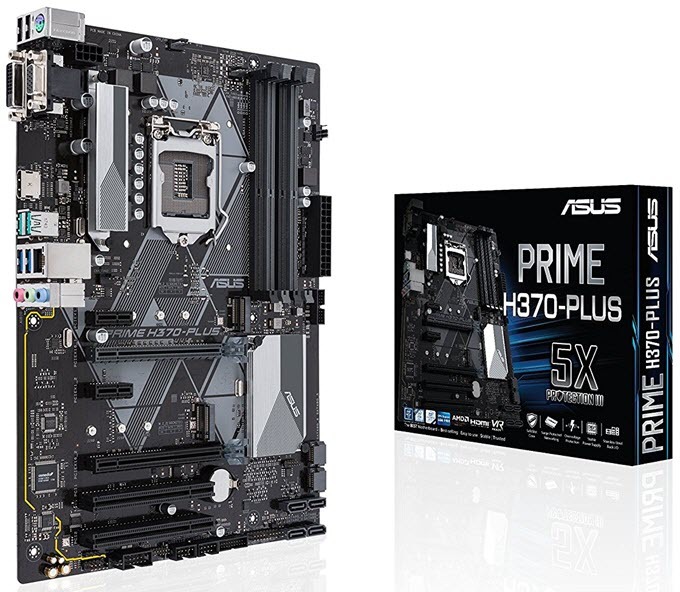 If you are a fan of Asus then this ASUS Prime H370-Plus Motherboard is the best option in this budget segment. This is an ATX motherboard that comes with two PCI-Express x16 slots with CrossFireX support, Dual M.2 slots for SATA SSDs & NVMe SSDs, DDR4 2666MHz memory, four PCIex1 slots and two PCI slots for older expansion cards. It does misses out on USB Type-C slot which is a bit of shame. Other features include Intel Optane Memory support, Onboard 8 channel audio, Gigabit LAN, UEFI BIOS, Asus SafeSlot, CrossFireX support, VR Ready, Native M.2/NVMe PCIe RAID Support. It works with Windows 10 64-bit Operating System. This is a reliable budget motherboard but I think Gigabyte ones offers more features in somewhat lesser price. One of the cheapest B360 motherboards that you can get for your Intel 8th generation Coffee Lake processors. This is a basic motherboard that comes with essential features for building a mid-range gaming PC using a decent Core i3 or Core i5 Coffee Lake Processors. It comes with one PCI-E x16 slot for graphics card, one PCIe x1 & PCIe x4 slots, M.2 slot for SATA & PCIe SSDs and DDR4 2666MHz up to 64GB. The motherboard lacks USB Type-C and USB 3.1 Gen 2 ports. Overall, it is a very good motherboard for the price for both gaming and professional work. This is a budget gaming grade motherboard based on the Intel B360 Chipset. 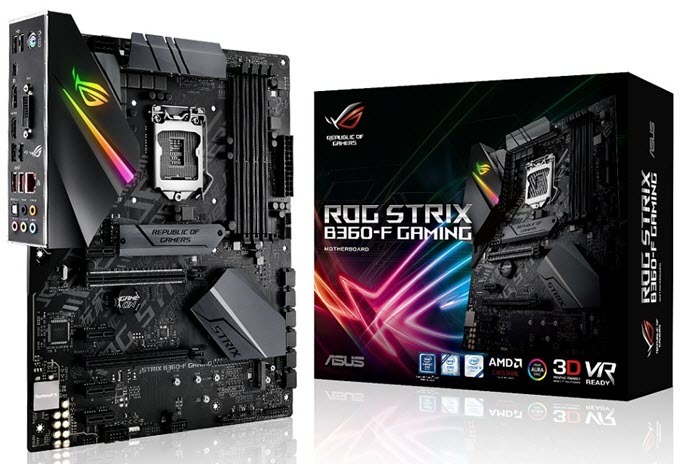 ASUS ROG STRIX B360-G GAMING Motherboard comes with all the features and expansion ports that you need for gaming purpose. It comes with two PCI-Ex16 graphics card slots, two M.2 ports for SATA & PCI-E SSDs, USB 3.1 Gen 2 ports, DDR4 2666Mhz support and is a VR Ready Motherboard. The motherboard also supports Asus AuraSync RGB LED lighting and it is a great looking and solidly built motherboard. You can check out its major specifications and features list from the table given below. This is a budget ATX motherboard based on the entry level Intel H310 chipset. 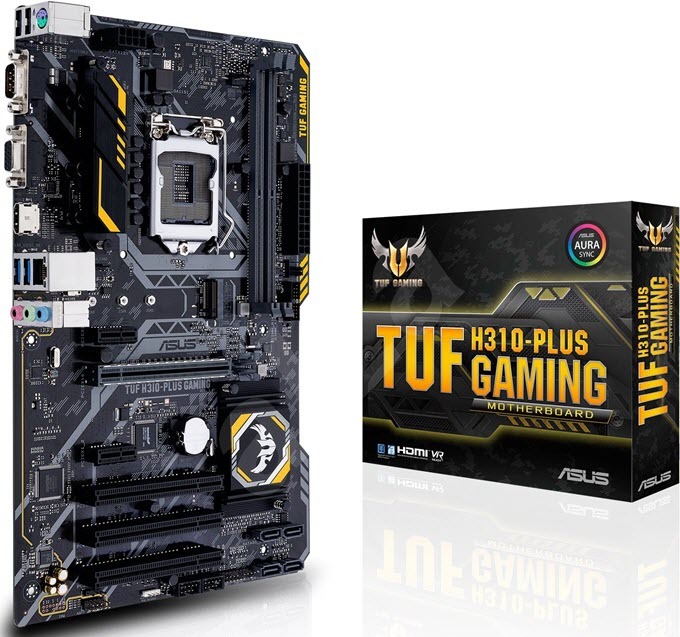 ASUS TUF H310-PLUS GAMING Motherboard comes with one PCI-E x16 slot, two PCI-Ex1 slots, four PCI slots and one M.2 slot for SATA and PCI-E SSDs. It supports DDR4 RAM up to 32GB and has got only two RAM slots. This is just a basic motherboard and is better suited for work rather than for gaming purpose. You can check out the specifications and features below. These are best Coffee Lake motherboards for building a mid to high-end gaming PC using the latest Intel 8th generation processors. This is a gaming grade motherboard from MSI based on the H370 chipset from Intel. 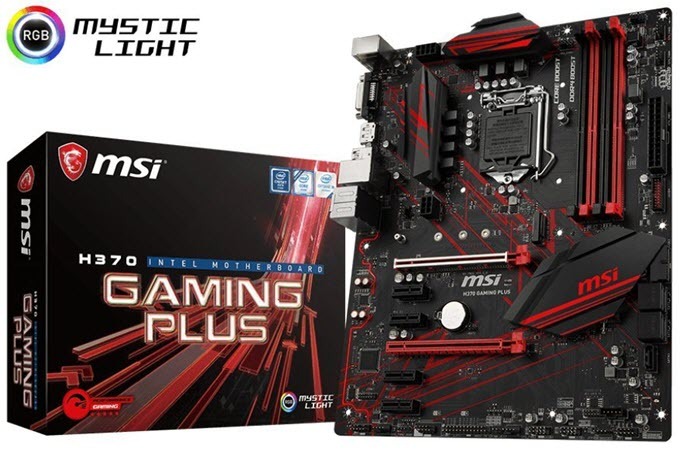 This MSI H370 Gaming Plus ATX Motherboard comes with two PCI-E x16 slots that supports AMD CrossFire, one Turbo M.2 slot for SATA and NVMe SSDs, USB Type-C port, Gaming Heatsinks, RGB Mystic lighting and supports up to 64GB DDR4 2666MHz memory. The motherboard does come with DisplayPort and DVI ports but you won’t be using them because for gaming as you have to use a decent mid-range to high-end graphics card. 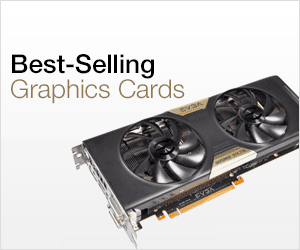 You can check the whole specifications and features of this gaming motherboard below. This is one of the best gaming H370 motherboards that you can get for your 8th generation Coffee Lake CPU. 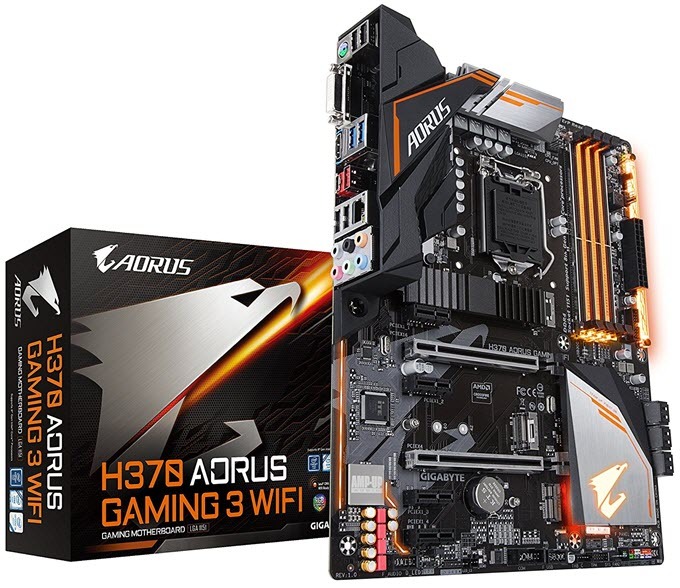 Gigabyte H370 AORUS GAMING 3 WIFI is a feature rich motherboard that comes with two PCI-E x16 slots, dual M.2 slots, in-built Wi-Fi, USB Type-C port and supports DDR4 RAM up to 2666MHz speeds and 64GB capacity. The motherboard comes with heatsinks to prevent it from getting hot under intense gaming conditions. You can check out the complete specification of this motherboard below. A B360 chipset gaming motherboard from MSI that comes with almost the same specs and features that is found in the above mentioned MSI H370 Gaming Plus Motherboard. The only difference is in the number of USB ports and the Chipset used between this MSI B360 Gaming Plus and the MSI H370 Gaming Plus Motherboard. You can check the specifications and features from the below. Gigabyte B360 AORUS GAMING 3 WIFI is a motherboard that has got the same specs and features as found in the above mentioned Gigabyte H370 AORUS GAMING 3 WIFI Motherboard. The only difference is of the B360 chipset while other features and specs remains the same. You can check the major specifications and features down below. A gaming motherboard from Asus on the B360 chipset. 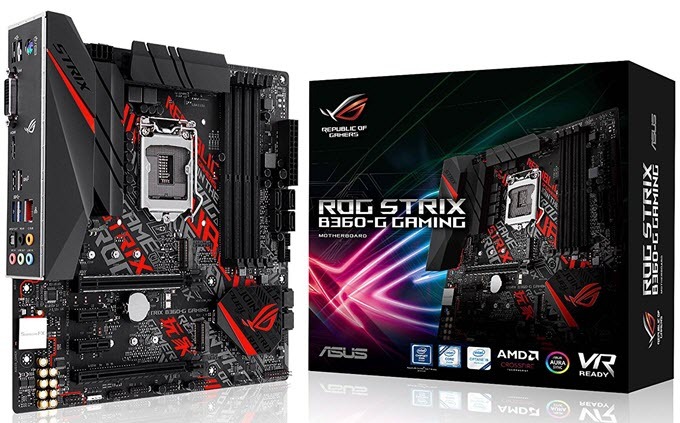 ASUS ROG STRIX B360-F GAMING is a solid motherboard that is feature rich and has got all the essential expansion ports. This Coffee Lake motherboard comes with two PCI-Express x16 slots supporting AMD CrossFireX multi-GPU technology, four PCI-E x1 slots, two M.2 slots for SATA and PCIe SSDs and supports DDR4 266MHz RAM up to 64GB. Display connectivity options include SVI-D, HDMI and DisplayPort. The motherboard is a bit on the expensive side but is totally worth it. You can check the specification and features list from the table given below. 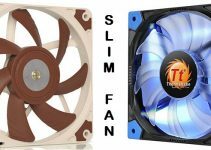 So, if you are looking for some budget and powerful Coffee Lake Motherboards then the above mentioned motherboards will not disappoint you at all. These motherboards are based on the newer Intel 300 series chipsets (H370, B360, H310) and are great for building a budget or mid-range gaming PC or workstation using the Intel 8th generation Coffee Lake processors. If you have got any queries or doubts then please leave a comment below.